Cranberries health benefits go way beyond cellular detoxification and easier weight loss – you’ll be surprised to find out that both traditional and alternative medicine recommend using fresh cranberries for a multitude of ailments. Believe it or not, the Romans were the first known to use fresh cranberries for medicinal purposes. Later, in 1578, the herbalist Henry Lyte thoroughly documented the use of cranberries for gout, rheumatoid pain, scurvy, fever, diarrhea, skin wounds, colds, eczema, and various infections. But the health benefits of these little red berries are proven beyond natural medicine. Recently, researchers from the University of Laval and Wisconsin-La Crosse have found that fresh cranberries improve circulation, increasing plasma antioxidant levels and reducing the risk of heart disease. They’ve also demonstrated that fresh cranberry juice increase the blood levels of good cholesterol (HDL) and reduce the oxidation of bad cholesterol (LDL), making it less likely to enter artery walls. So if you’re struggling to lower your cholesterol levels naturally or worried about cardiovascular problems, cranberries can help your condition. With a high iodine content (400 mcg/half cup), fresh cranberries are also part of the best diet for hypothyroidism. As you can see, these incredibly valuable berries provide weight loss and general health benefits far beyond essential nutrition. This is due to cranberries’ high content in vitamin A, carotene, thiamine, riboflavin, niacin, large quantities of vitamin C and antioxidants (phenols), along with a high content of minerals (sodium, potassium, calcium, magnesium, phosphorus, copper, sulphate, iron) and organic acids (quinic, malic, benzoic, and citric). Due to their widely recognized health benefits including their help in weight loss, cranberries are commonly available in the marketplace: fresh, dried, juice concentrates and cocktails, dried powdered capsules, extracts, and herbal teas – you’ll find them everywhere. However, the best is to make your own cranberry juice at home with your own juicer. Why? 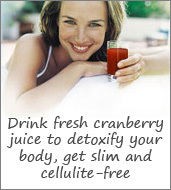 Because only the fresh juice fully preserves cranberries health benefits. The home made juice has a much higher quality then the commercial variety, which has lost all vitamins through pasteurization and is loaded with sugar and preservatives. But if you can find unpasteurized, organic, 100% pure, unsweetened cranberry juice at your local market or health food store – by all means, go for it! It’s very easy to juice fresh cranberries at home with just about any juicer. If the juice is too tart, sweeten it with fresh apple juice at a ratio of 1 part apple juice to 3 parts cranberry juice, as cranberries and apples are a great mix. You can also sweeten the juice with liquid stevia or, if you don’t worry about the calories, use maple syrup (organic is best). When you buy fresh cranberries choose the bright red, hard, and plump ones; stay away from soft, dull, or wrinkled berries. You can keep the fresh berries up to two months refrigerated. Or, you can freeze them for up to a year sealed in plastic bags or containers. The dried ones last for over a year in a dark and dry place. 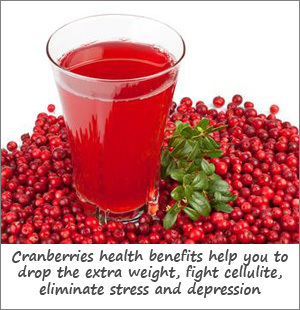 How to Use Cranberries Health Benefits for Weight Loss & Cellulite Reduction? Well, you’ll be amazed at how much easier you’ll drop the extra pounds when you drink 1-2 glasses of freshly made, pure cranberry juice daily (or 2-4 glasses if you dilute it with water in equal parts). But make sure to use only liquid stevia instead of sweetening it with maple juice or even apple juice – as both have too many calories. The fresh cranberries health benefits – along with their distinctive flavor and bright color – make these little red berries perfect to be used in any fruit or green salads and dressings. Have a bag of frozen or fresh cranberries handy and use them liberally in various raw snacks and juice blends. Cranberries grow throughout the cooler parts of the Northern Hemisphere and are only harvested from October through December. Amazingly, there are 150 species of cranberries in the world, but North America produces 98% of the world’s cranberries. The most popular variety is the American cranberry, (Vaccinium macrocarpon). Their high nutritional value was well-known to native Americans and they introduced them to the English settlers in Massachusetts around 1620. 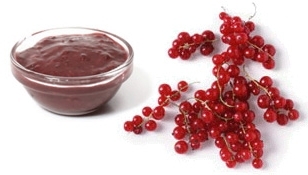 The English then incorporated these tasty berries into the Thanksgiving feast as cranberry sauce, now served traditionally with roast turkey. Wondering where the name “cranberry” comes from? From crane berry: before the flower expands, its stem, calyx, and petals look like the neck, head, and bill of a crane. In north-eastern Canada cranberries are sometimes called moss berry.